Smooth focus !!! - SolarChat! I have contacted a few astronomy outlets here in the UK but not gotan answer yet, what I need to know is which electronic focuser will fit my Explore Scientific 80? Has anyone fitted one to an Explore Scientific and if so which one? 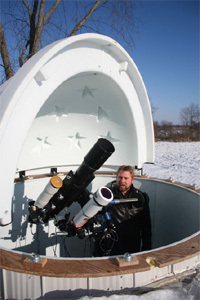 The latest reply was from Altair Astro and they suggested a Pegasus cube, but when I look at the bottom of the current focuser on my scope there are NO holes in which to fit it. Can anyone advise please. Below is a pic of my current focuser, you can see there are no holes in which to fit a focuser such as the Pegasus. I looked at the Altair Astro site and their motor focus options, and both the Cube and Refractor V3 options and they look like they should do a good job. The Cube unit has the motor built into it and the Refactor unit gets more expensive by the time you buy the controller and motor, but I assume it gives the option to use one controller on several scopes. From what I read both are controlled only by software which means having a computer at your side any time you want to use it . If I missed a hand control option my apologies, but I do not see one referred to at all. With regards to the mounting system, they have a pic that shows the universal bracket bolted to a mounting plate...I guess it works. Can you do a wider shot around the focuser...maybe you could drill a hole to mount it but I'm not familiar with this scope/focuser. Most of the motor options I've used ate based out of North America, so they may not be as readily available or cost effective with shipping and taxes factored into the choices. The link below shows the different focuser configurations used on the ES scopes...do any of these look like what you have? If you want a simple hand control/bush button controller these JMI units are pretty good, I used them for years and still have one somewhere in the surplus parts drawer in the observatory. There are options to add control from software if you need that as well. Thanks for that MapleRidge it looks as if that is the one, the details at the end of the page says it is for, as well as other scopes, for an Es ed80. Would it fit on the right hand ( my pic above) side of my scope where the fine focuser is? Which of the sample focusers does yours match up to then? There must be a lock screw or something similar that wasn't in your photo. The JMI have a collar that spreads over the fine adjust knob and uses it to make the focus adjustments. The drawback is they shouldn't be manually focused or you will wear the collar on the focuser but you can turn the motor speed up to make a large focus movement and go back to a slower speed to do the finer work. The trick is finding a supplier in the UK or order direct. The JMI line was sold and transferred to Far Point Astro...Far Point has a good name in the astronomy community so you could check if a local shop carries any of their product. The solution I've used on all my refractors (with 10:1 gearing) is to add an Orion/ Sky Watcher focus motor package. I then use a 6mm wide MXL 100 tooth timing belt and a 30 tooth pinion (with 6mm bore) to provide a geared drive to the 10:1 knob. This works very well on all three of my ED80, spectroheliograph and TS102,and very cost effective. Looking at the video,(https://www.youtube.com/watch?v=SgfE-h8ejr8) there appears to be the "usual" four small screws on the drive module. Maybe they are hidden behind the dovetail shown in your photo??? You may be able to fit a Sesto Senso. It's convenient because there is no separate external controller box, it is a self contained unit. The standard fits an outer focuser race of 25mm, but they have adapter collars for a few other sizes. I just installed one on my Stellarvue SV80ST, it works quite well. I usually make my motofocusers with a small electric motor that comes with a gearbox. Hi Pedro thanks for the pics. I cannot put anything below the focuser ( see your last pic) as there is no room due to the longer vixen bar, a longer bar helps achieve balance. It looks like either a JMI or an Orion. The problem is I am not dexterous, I struggle making a mess, so the unit has to fit onto my scope without any engineering of any sort, I wish I was handy but I’m not. I have contacted many outlets but as yet I cannot find anything that fits my scope. I looked at a Primeluce sesto senso but the dimensions are not compatible. I would look at ways and means of moving the dovetail and apply other solutions to the balancing issue. The focusing rig at the right of my photo, has the small motor with a gear reduction box fixed to the dovetail plate with a piece of aluminum crossbeam, and It works very well.